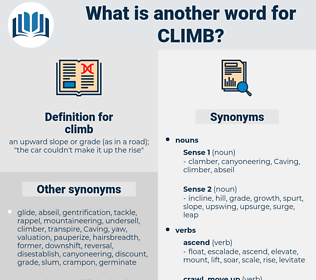 What is another word for climb? an upward slope or grade ( as in a road); " the car couldn't make it up the rise"
ascend, jumping, grow, walk, ride, assemble, reassemble, jump, recover. downfall, sinking, downgrade, plop, wane, plummeting, down, comedown. dismount, descend, decline, decrease, go down, fall, slump, retreat, lower, drop.
" Us mun climb the wall," said Mary. mountaineer, clamber, scramble, sputter, shin, skin, ride, shinny, ramp, escalade, struggle, scale. get on, shape up, get along, come along, advance, come on, progress. go up, slope, lift, rise, come up, uprise, pitch, incline, move, arise, move up.